Pollfish Indicator Settings refer to intrusiveness of Pollfish surveys within an app. These settings can be changed easily through Pollfish Developer Dashboard and changes apply instantly within the app.  - Pollfish indicator: is the small red rectangle that users see within the app. - Pollfish Panel is the first screen that users see when they click on Pollfish indicator. With this setting Pollfish indicator is shown with the app to the user when a survey is available. 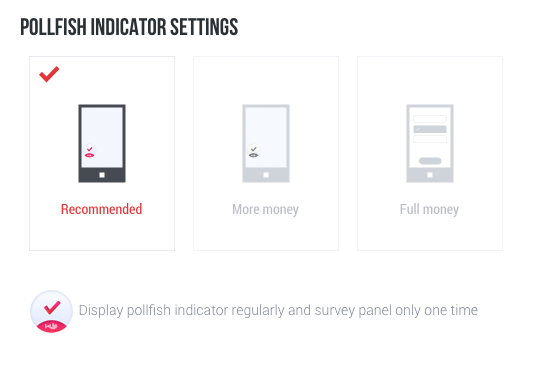 If user sees the indicator up to 4 times without clicking it, Pollfish panel opens and Pollfish survey first screen is shown to the user (same effect when user clicks on indicator). This happens only once. After that user always see Pollfish indicator. With this setting Pollfish indicator is shown with the app to the user when a survey is available. If user sees the indicator up to 4 times without clicking it, Pollfish panel opens and Pollfish survey first screen is shown to the user (same effect when user clicks on indicator). This happens every 4 times that the user sees the indicator and does not click it! With this setting Pollfish indicator is never shown within the app. When a survey is available Pollfish panel always slides open and takes user to the first screen of the survey. This is the most intrusive option since it does not wait for user to click on something to see a survey and it always open to him/here the first screen. As expected this option has the highest conversion rate.